If you follow me on Instagram, it's no secret that I've been dancing a lot lately. It all started about a year and a half ago when I asked my husband to go to ballroom dance classes with me at The Dance Lab for my birthday present. We started with one class a week for one month. The second month we were doing two classes a week and before we knew it, we were also having private lessons, attending dance competitions and going to monthly socials. I rather willingly fell jumped down a rabbit hole and I haven't looked back. About 5 months in my husband decided not to pursue it any further, but it wasn't the same for me. I wanted to continue learning to Latin dance and we agreed that I should carry on. A year and a half later I'm taking two private lessons and two classes a week as well as multiple solo practice hours in the studio and signing up for every workshop I can get my hands on. I recently participated in my first dance competition (click here to see a photo), I'm training to take a medals exam later this month and I have another competition in Blackpool next month. To say that it's addictive would be an understatement and to be honest, I've never felt better. Latin dancing is mentally stimulating, physically challenging and a lot of fun. For someone like me who works from home, having a fun, healthy, active hobby to enjoy that gets me away from my desk for a few hours a week is not only invaluable, it's helped to improve my focus, productivity, stress levels and fitness. 1. Where can I get dance shoes? 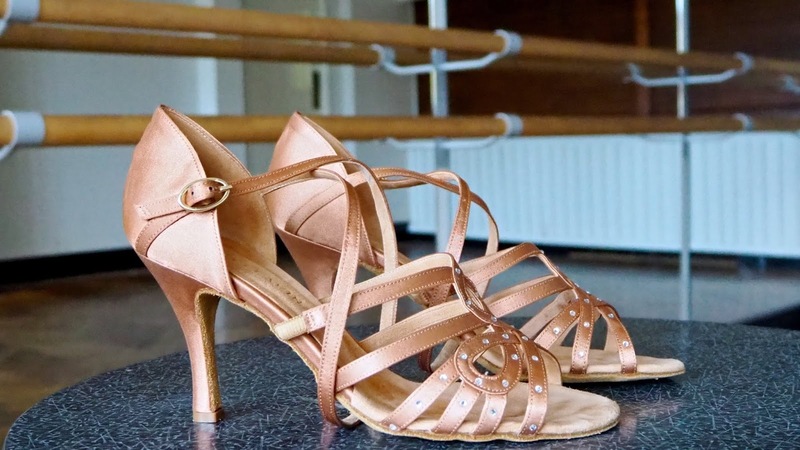 While there are a few places here and there to try on Latin or ballroom shoes in London or other various cities, I think most of the time you're better off ordering a pair of shoes online that are ready-made and trying them on at home. Most stores don't have a very big selection or a lot of sizes, so in my experience you can run yourself ragged and end up empty-handed at the end of the day. Ordering online is easy, but just make sure the return policy allows you to send them back if they don't fit. Find a pair you like or that you think will work for your feet and order 1/2 size smaller than your normal shoe size. Once you find a brand of shoes or a pair that you like, you opt for made-to order options for your next pair like heel height, other specifications or experimenting with different styles without having to worry too much about the sizing. 2. Where can I get a Latin dancing skirt or dress? There are a variety of options available, but they aren't always easy to find. If you're on a budget or you simply don't want to spend much, I recommend Amazon or Light in the Box for affordable options. I've also been known to buy the odd skirt or dress from ASOS (including the one in these photos) for a steel to wear for dancing - something with fringe or a ruffle usually. Chrisanne Clover, DSI and International Dance Shoes all offer lovely practice wear, but these options are quite a bit more expensive. If you want something very specific, you can have bespoke skirts and dresses made to your specifications by one the above mentioned brands or a dress designer. The simple answer to this question is "as much as you are willing to pay." You can do as little or as much as you like when it comes to dancing and how much it costs should really come down to what you budget for it and what you can afford. Group classes can be as affordable as £10 per hour, so it doesn't have to cost the earth, but the sky is the limit in terms of how much you could spend. Private lessons, workshops, socials, competitions, competition dresses, international competitions, pro-am fees, travel and so forth can all be very expensive, but the great thing about dancing is that you can decide how much you are happy doing and make the most of it. 4. Do I need a partner? This is probably the question I'm asked the most. A partner is not at all required to start ballroom or Latin dancing. In most group classes you will change partners throughout, so everyone dances with everyone else. If you take private lessons, you can of course bring a partner, but there's also the option of dancing with a teacher (this is what I do). Not having a partner in a ballroom or Latin class is not at all like going to the prom without a date... You'll meet so many people and dance so much that even if you do bring your significant other, you won't spend all your time together. 5. What if I don't want to do a competition? Then don't do a competition. I've done a competition now, but for the first year I was against the idea completely and it didn't make my experience any less valuable. A competition can be great to keep you motivated and goal-oriented, giving you something to work toward and specific choreography to focus on. The actual competition itself gives you a chance to perform what you've worked on and analyse your dancing to see where you can improve or what you could be doing differently, however there's absolutely no requirement to compete if you don't want to, can't afford it or don't feel ready. If you want to perform without competing, there are showcase options. If you're not interested in performing at all, you don't have to and that's absolutely fine - many people choose to focus on dancing for social purposes only. If you're worried about having a goal, there are medals exams at various levels you can take to mark your progress. While Latin and ballroom dancing is known for being very competitive, it's not necessary for you to compete to enjoy it. Not every runner enters races or marathons - some people just run for fun and fitness. Likewise, not every ballroom or Latin dancer is a competitor. If you have any questions about dance or anything else, feel free to comment below or ask me on Instagram (click here to follow @pinkjulep) and I'll do my best to answer them either with a blog post or on Insta Stories. For more information about Anita Flavina Dance Shoes or to order a shiny new pair visit anitaflavina.com and don't forget to use the code pinkjulep10 to get 10% off your order! (Just to give you an idea, if you order the Grace With Strass style pictured above, that's a savings of £14.50!) The discount code is only valid until 31st October 2018. Special thanks to Anita Flavina Dance Shoes for providing the discount code and the shoes featured in this post. All views are strictly my own and in no way influenced by Anita Flavina Dance Shoes or any other parties associated with the brand. All photos taken at The Dance Lab by Marc Walsh.